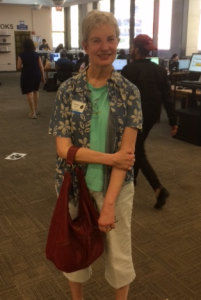 On Wednesday, May 2, 2018, the staff of the Birnbaum Library was delighted to welcome Pace alumna Mary Carey (Class of 1970). Mary, who majored in English and worked as a student worker in the library, shared fond memories of her student experience. At the time, Henry Birnbaum, after whom the library is named, was Library Director; as she recalls in the audio clip below, Mary witnessed the notorious Hard Hat Riots, which occurred in and around Pace; and she often found herself on the same trains and buses as legendary basketball player and coach, Phil Jackson. This was no mere coincidence, as they lived on the same block in Bayside, Queens, and while Mary worked and studied at Pace, Jackson and the rest of the New York Knicks practiced in the gymnasium of the newly opened One Pace Plaza. Those were the days!